The second of a series analyzing Wikipedia’s structural, policy and financial problems. This page should not be speedily deleted because i find all of the material taken from valid references. You guys think every episode of The Simpsons should have it’s own wiki page, but an international UN lawyer should have her page deleted? Is that because she is female? Is it because she is Middle Eastern? Is it because she is engaged to George Clooney? This person is newsworthy in her own right. Even prior to the news explosion of the last few days, there was a lot written about her in conventional news sources and she is famous in a field that is of great public interest. The comment about censorship aligns with my previous post in this series: Wikipedia censorship is a feature, not a bug. Wikipedia’s software allows arbitrary editors or group of editors to deny access to information based on arbitrary rules, and to delete that information while they discuss it. The end result is that the vast majority of readers may never have access to information. This post is, however, about Wikipedia’s conflict between what it deems to be encyclopedic and what is newsworthy. This is a worthy distinction. Most people will agree that an encyclopedia should not cover the same topics as a newspaper. An encyclopedia would lose its credibility if it discussed the dresses of famous actresses. But this is news to many people who follow fashion and celebrity culture. On the other hand, a newspaper does not carry in-depth articles about String Theory. On Wikipedia, notability is a test used by editors to decide whether a topic can have its own article. Information on Wikipedia must be verifiable; if no reliable third-party sources can be found on a topic, then it should not have a separate article. Wikipedia’s concept of notability applies this basic standard to avoid indiscriminate inclusion of topics. Article and list topics must be notable, or “worthy of notice”. Determining notability does not necessarily depend on things such as fame, importance, or popularity—although those may enhance the acceptability of a subject that meets the guidelines explained below. So it’s clear: a topic is notable if it has sources. But every news story, by definition, has a source. Let’s dig deeper. On second thoughts let’s not. There are probably fifteen pages of notes on notability on Wikipedia, but the end result is the same: If a group of other editors don’t think something is notable, then it’s out, or it’s in — whatever they decide. You’ll never know until you challenge the system, and the system is stacked against you. This conflict between encyclopedic and newsworthy topics has become more pronounced recently because Wikipedia — as an encyclopedia — is complete. It has been an incredible success and the people involved should rightly be proud. But, there simply isn’t that much more to say about many encyclopedic subjects. How much more is there to say on a daily basis about dinosaurs? Most scientific topics move slowly, as they should. This leaves Wikipedia editors with little to do except 1) defend their turf 2) play politics and 3) chase news stories. Because new editors find it impossible to add anything, Wikipedia’s active user numbers is in serious decline. In the English Wikipedia, editors making more than 100 article edits per month were down to 2,976. This figure had otherwise been consistently above 3,000 since March 2006, with a high of 4,789 in March 2007; it dropped below 3,000 for the first time in September 2013. New Wikipedia account registrations were below 6,000 (5,858) for only the second time since December 2005; the high-point was 13,851 in March 2007. The few who stay cannot ever hope to challenge the orthodoxy on established pages — editors and admins on those pages are far too entrenched. So when some news comes up they flock to it. At last! Something to write about and not get instantly deleted! So despite protestations that Wikipedia is not a newspaper, we see long pages on the missing Malaysian Airlines flight, complete with poorly-consructed timelines, criticisms, and endless discussion. It’s ridiculously overwrought. While Wikipedia’s software works well for slow-moving encyclopedia-like content but does not work well for news. It’s not clear on the page what the latest news is. You can’t sort or filter the information on the page to see what happened first, or what happened most recently. There are few images, and no video. Worse, you can’t trust the information on the page because anyone can remove it. Wikipedia is an encyclopedia. Newslines is a news archive. In fact, I agree with those who deleted Ms Alamudin’s page. 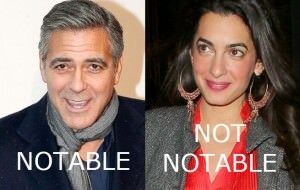 Just because the future Mrs Clooney is in the news does not mean that she should be included in an encyclopedia. Perhaps she could be included if she had won an important lawsuit, or contributed to legal opinion, but that’s not the case. She is marrying a celebrity, and that’s not encyclopedic. Maybe put one line on George’s page. Most news items and many profiles should also be deleted or shrunk for the same reasons. They are not encyclopedic, and are simply being made by bored editors. Long articles do not serve the readers well. Wikipedia should concentrate on its core mission and stop trying to be something it is not. In the same way that Wikipedia is not a news archive, Newslines is not an encyclopedia. It’s a place to compile news archives about any subject: people, products and events. Newslines simplifies the rules by not being concerned about notability — that decision was already made by the source, which has deemed it newsworthy. If it is in the news it can go in Newslines. It’s a simple rule, easily applied. Amal Alamuddin, welcome to Newslines.